We are so grateful for all of the love and support that has poured in over the past year as we prepare for marriage. Because we will be traveling for all of our wedding events, we have chosen this registry to make our lives easier and to make gift giving more secure. We will breathe easier in India and Florida knowing there are no packages waiting on our doorstep. We have selected trips and experiences that will bringing us closer as friends and partners in our marriage. We feel this registry represents all of the best parts of our relationship--adventure, health, and spirit building. It's very exciting to share that with all of you! Thank you for everything. We can't wait to see you in April. Caitlin is a member of the DFW chapter of Room to Read. About us: We work in collaboration with communities and local governments across Asia and Africa to develop literacy skills and support girls to complete secondary school. Operation Kindness--This is North Texas' largest no-kill animal shelter and Kapil's favorite charity. Kapil loves snowboarding. Caitlin likes to spend time in nature on two feet. A trip to Big Sky and Yellowstone will delight us both. California Zephyr Train Trip-- We have been dreaming of this trip from Denver to San Francisco! This gift includes two tickets and a private room. Maine Coast. We've never been to our most Northeastern state. This is a weekend away at a serene coastal cottage where we will walk the beach and look for whales. McKenzie Care! The hardest part of traveling is leaving our best friend behind. Luckily, we have found a wonderful boarding company. This gift is for a package including 10 days and nights of high quality dog care. Tennis Lessons-- Kapil plays tennis twice a week and loves it! He wants his bride as a tennis partner, but she would need some basic lessons first. Each gift covers one private lesson with a tennis pro at Kapil's favorite courts in Dallas. Women's Tennis Racket for Caitlin. 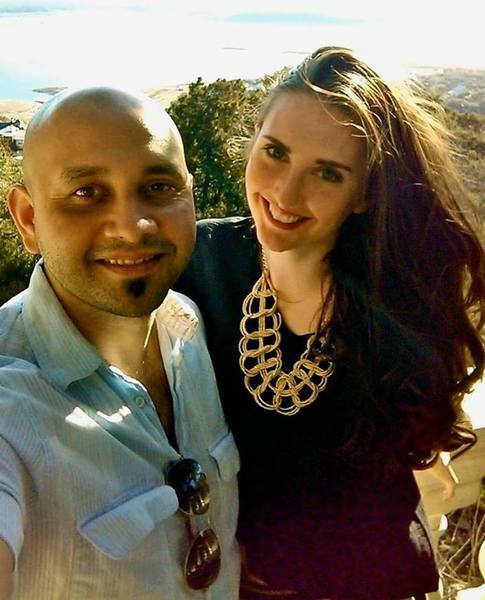 Yoga Memberships-- Caitlin & Kapil have both practiced yoga for years and love that they can share in this physical, mental and spiritual practice together. This gift is for two six-month memberships at their favorite Dallas studio. Snowboard for Kapil-- We bought snowboards in Colorado, but Kapil's was stolen from our car. He would love to have his own again, so he can skip the rental lines and head straight for the mountain. Organic Produce Box-- Every Wednesday, we receive a big box of organic fruits and vegetables, as well as fresh eggs. We love this service. Each gift would provide us with one box, allowing us to cook healthy meals for a week. Hiking boots for two. After a couple of years in Colorado and hiking the Lares Trek in Peru, our shoes have holes in them. To explore some of the beautiful destinations in our travel section, we'll need some heavy duty footwear. Cooking Knives-- We feel very fortunate to have built a home together over the past couple of years. The only thing we need to upgrade is our cooking knives, to chop all those delicious vegetables. Neighborhood Services Date-- Anyone who has visited us knows this is our spot! Kapil orders steak, Caitlin orders scallops. We sit at the bar and drink Manhattans and Prosecco. Each gift will provide us with a date. Beats Headphones-- Kapil has been eyeing these for awhile. They're perfect for nights when Caitlin goes to bed early, but he wants to stay up late and listen to Lady Gaga. This happens more frequently than you can imagine. Spiral Cafe & Diner Date! This is our other favorite spot in Dallas, and it's all vegan! If you send us here, we will eat nachos, meatball subs and ice cream guilt-free.